High Peaks Birders had its beginning with the monthly strolls offered by High Peaks Trail Association starting in March 2014. Laura Seelbach and Bob Repoley lead the strolls and eventually went on to organize the Yancey County Christmas Bird Count later that year. Both the strolls and the CBC were well attended by birders and nature lovers from expert to beginner. 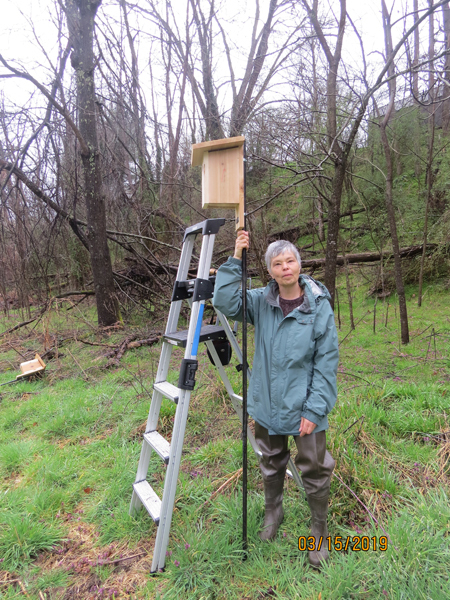 Springing from these successful ventures, a core group of interested people met in January 2015 with the intention of exploring the possibility of starting a birding club in Yancey County, which was eventually called “Yancey Birders”. The core group, now known as the OWLS, began organizing birding activities in the county and at the same time opened up discussions with High Peaks Trail Association about coming under the “wing” of High Peaks. In May 2015 after organizing two successful general meetings and contributing to other birding activities in Yancey County, Yancey Birders joined High Peaks Trail Association and took the new name of High Peaks Birders. All of our events are free and open to the public. We do not have a formal membership. Anyone who comes to an event or meeting can choose to be on the High Peaks Birders mailing list and receive our occasional Newsletter. If you do not receive our Newsletter and would like to, simply click on the link “Subscribe Mail List” at the top right of this page. We encourage all birders to join High Peaks Trail Association and support the people who support us. The OWLS continue to meet once a month to plan programs and activities. These meetings are open to the public. Please feel welcome to attend and take part in what we are hooting about. We also offer monthly birding strolls at Cane River Park and maintain a growing list of birds spotted during these outings. Check out the High Peaks Monthly Activity Calendar for more details. For some tips on birding, please read our Birding Etiquette Guide. High Peaks Birders will have a stationary bird watching event on Saturday April 20th at Ridge Junction on the Blue Ridge Parkway. Please meet us EARLY on the town square at 6:15am, we will carpool up to Ridge Junction Overlook, which is just before the road which goes up to Mount Mitchell. Bring binoculars, water, maybe a hat, and chair if you like. We will go rain or shine UNLESS the weather shows extreme rain forecast. Questions, call 208-5378 by Friday the 19th. Our Spring migrants are beginning their journey north and this location is a great place to view them as they travel through. If you miss us at the square you can always join up with us on the Parkway. Found only in North America, bluebirds are popular birds, with their bright colors and soft singing. They nest in cavities, which left them vulnerable to introduced starlings who outcompeted them for spaces. The enthusiasm for putting up nest boxes has helped them bounce back in recent years. 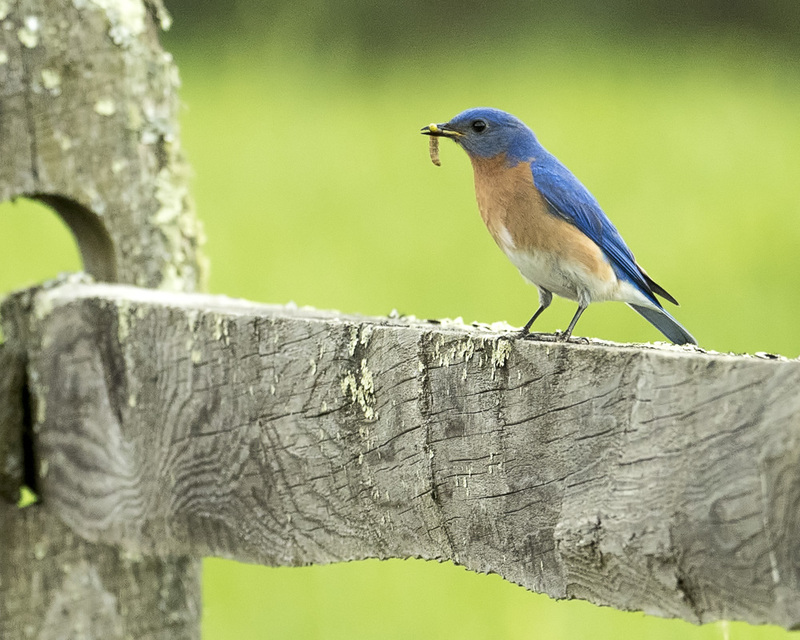 The Eastern Bluebird is the one found in our area, breeding in semi-open territories with good perches and nesting chances. The male is the one with bright blue feathers. His mate will carry less blue and be a bit duller. They can be found year around here in Yancey County, feeding on insects and berries primarily. The eggs are blue (what else?) and incubated mostly by the female. Both parents feed the nestlings. Steve Buettner, photographer, for High Peaks Birders and High Peaks Trail Association. 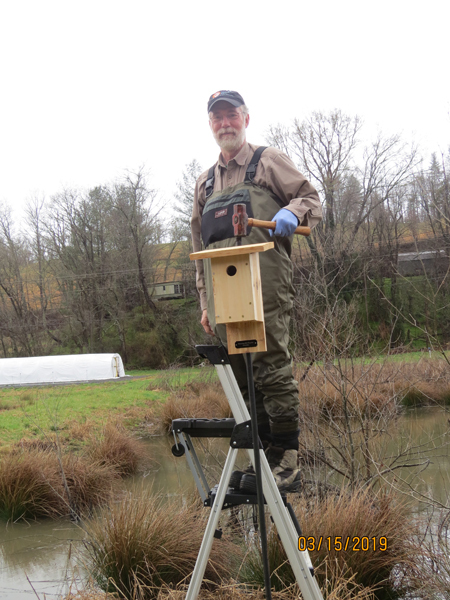 To honor Bob Repoley and all the work he did for birds and the High Peaks Birders, Laura Seelbach and Russ Oates are placing 10 memorial Bluebird nestboxes around Yancey County. These nextboxes were made by Bob and Russ and can be found at the following locations: Cane River Park, Mountain Heritage High School, Carolina Native Nursery, Yancey County Humane Society, and Mountain Aire. Thanks for helping the birds! Beginner’s Guide to Bird Watching Around Your Home : This is a great source of information about birding for beginners. May Wildlife Rehab Center: This is an outstanding rehab facility for injured or orphaned birds and other wildlife located on the Lees McRae campus in Banner Elk, NC. Cornell Lab of Ornithology: A great site for bird ID and bird webcams. Carolina Bird Club: A birding club spanning North and South Carolina. Partners In Flight: An organization that coordinates international efforts to conserve bird populations in the Western Hemisphere. Bird Note: Podcasts and stories about birds, the environment, and more. Big Bald Banding: Southern Appalachian Raptor Research and banding station in Madison County, NC. Carolina Native Nursery: A great source for native plants that will attract birds and other wildlife. Beginner's Guide to Birdwatching: Tips and ideas for blossoming birders.